The U.S. government is moving ahead with ambitious plans to implement alternative energy at its own facilities. In a pilot program, two Veterans Affairs hospitals are already demonstrating the viability of solar energy-in facilities that operate 24 hours a day on life-critical tasks. One of the main challenges with the VA projects was working with 24/7 hospital operations. SunWize Technologies had to avoid impacting hospital operations while getting the modules, and everything else, on top of the buildings. President Barack Obama has announced initiatives to invest billions of dollars in making government facilities more energy efficient, have them utilize alternative energy, and reduce greenhouse gas emissions. But some federal government facilities are already there and could serve as models for upcoming projects. In 2007, President George W. Bush signed an executive order for federal agencies to improve energy efficiency. Facilities were to reduce greenhouse gas emissions by three percent a year, or 30 percent, by the end of 2015. The U.S. Department of Veterans Affairs (VA) was quick to respond. It developed a comprehensive department-wide survey of its major facilities for their solar, wind, geothermal, and biomass energy potential. The VA, in conjunction with the National Renewable Energy Laboratory (NREL), made visits to 16 hospitals to find the most effective site to conduct a PV (photovoltaic) solar pilot. "They chose the Loma Linda facility in California, but then the Dallas site was also included," says Rick Hart, Energy Manager at the Dallas, Texas VA hospital. After choosing the sites, the VA put out an RFQ for the two 300-plus kW installations, and SunWize Technologies was awarded the projects in early 2008. 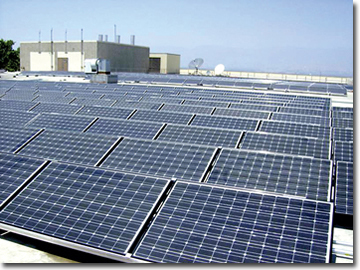 The systems proposed by SunWize for both Loma Linda and Dallas use the same high-efficiency Sanyo PV modules, racking systems, and Advanced Energy inverters. The main difference was that Loma Linda was a 309 kW DC system, and the Dallas system was a 337 kW DC set-up. The combination of advanced technology modules and inverters would make these systems two of the most efficient fixed-mount, crystalline systems in the world in terms of kW-hour production. Even though SunWize specializes in the engineering, design, and construction of large scale solar electric systems, these two projects presented some special challenges. "The main challenge was working with a 24/7 hospital operation," says Bob Hlavaty, senior project manager, commercial power systems, for SunWize. "We had to avoid impacting their operations while getting the 1,500-plus and 1,700-plus PV modules, and everything else, on top of these tall buildings." Another challenge for SunWize was working with all the entities involved in a government project. "In this case, we had the VA headquarters spearheading this initiative. Then there were the participating hospitals and their various teams, as well as NREL that was providing the oversight and inspection," says Mike Bauer, marketing manager for SunWize. Luckily, in this case, all the parties were excited about the project and worked hard to move it forward. The first installation at Loma Linda, covering approximately 60 percent of the hospital's 200,000 square foot roof, began in June 2008, was completed by August, and began operation this past September. One of the reasons Loma Linda was NREL's first choice was not only its location, but also California's attractive incentive plan. 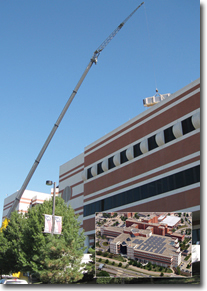 Lifting the inverter to the roof at the Loma Linda, California, VA facility would have required an extremely large and expensive crane. The construction team discovered that using a helicopter to lift the inverter (right) was much more economical. rebate-the state will match every kW we produce at a rate of 35 cents/ kWh." Over the five year period of the program, the rebates may exceed $800,000 based on estimated annual energy production of the PV system. Loma Linda estimates that by receiving $160,000 each year, for the first five years, and saving $60,000 annually in energy costs, the system will pay for itself in approximately 20 years. Barrett says that although the energy savings are substantial, the hospital is a huge facility, and the PV system will provide only two percent of the hospital's annual consumption-eight percent of its peak load requirements. To get what was needed for the project onto the roof, materials were lifted in 20-foot container boxes. 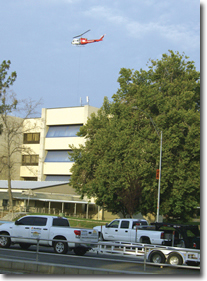 It took a great deal of coordination to close off parking lots, secure the top two floors of the hospital, and bring in a crane-as well as a helicopter. Lifting the inverter would have required an extremely large and expensive crane. The team discovered that using a helicopter to lift it was much more economical. "The helicopter was brought in on a flat bed from Palm Springs to minimize the number of hours of operation," explains Barrett. "Once it began, lifting the inverter went fast. It only took 10 minutes." The helicopter, however, required extra coordination. "We have an apartment complex right next door to the medical center. And we didn't want to scare them," says Barrett. The two-day process (one day for the crane, the other for the helicopter) was both fast and efficient. Everything was moved to the roof and unloaded within four hours. Loma Linda has a 10-year-old PVC roof, with a 20-year warranty, and the solar panels (designed for a 40-plus year life span) are likely to outlive the roof. Barrett's not too concerned. "The good thing about it is that the panels are actually protecting the roof from UV ray exposure. And the places where the panels are added will probably last longer than the roof." He adds, "Eventually, if the roof needs to be replaced, the panels can be moved in big groups. We would just relocate them temporarily and put them back in." Because of the seismic load design requirements in Southern California and the Santa Ana winds, which can reach 80 mph, the system had to be anchored to the roof using Hilti anchors. "We had about 70 supports throughout to tie down the panels and a Hilti representative there to make sure it was all anchored properly," says Barrett. The system has already been tested by the high winds, and Barrett says everything worked fine. In fact, if anyone is curious to see how the system is performing, they can visit Loma Linda's monitoring system at https://view2.fatspaniel.net/PV2Web/merge?view=PV/detail/HostedAdmin&eid=150234. Once the Loma Linda project was complete, work started at the Dallas site, which takes up approximately 80,000 square feet (or about half) of the hospital's roof. One of the reasons NREL chose Dallas was because it is located in an electrically congested distribution system. "There's a natural constraint here," says Rick Hart. "When the temperature gets up to 102 or 105 degrees, the system is already overloaded. By putting a system up that works during the heat of the day, we're reducing our peak electrical demand and helping the neighborhood." The panels used on the hospital were similar to those you would find on residences, but on a much larger scale, and that required taking a different approach. "Techniques that were OK at the residential level didn't necessarily work as well by the time you push them up into the large industrial commercial applications," says Hart. Dallas and SunWize became trailblazers in scaling up. "We had to get it right because people were going to be looking at us. If we failed, we were going to fail miserably . . . and very visibly," says Hart. Together, solutions were found and implemented. "It took about six weeks to get everything hashed out," says Hart. "That's not bad-because this is a huge system." In fact, it's the largest installation in Texas. The Dallas facility knows about huge. The mammoth hospital, situated on 86 acres, has a summer electrical demand close to 10 MW. The PV system represents about one-third of a percent of its needs. "It's still a lot of electricity," says Hart. "And we use it all up. We don't sell back any." Installation at Dallas was similar to Loma Linda's-minus the helicopter. Once everything was on the roof, it was (for the most part) complete in eight weeks. "I was surprised," says Hart. "It went up faster than I expected, and that included an electrical contractor hooking everything together." No sooner were the panels installed than Dallas was hit with a weather microburst strong enough to take down the Dallas Cowboy's practice facility several miles away. The storm uprooted trees and even knocked over two light poles in the hospital's parking lot-but the solar system stayed put. Hart says he's very glad the original proposed anchoring system, using ballasting materials to anchor the panels, was replaced with a more aggressive system that penetrated the roof and anchored the panels to the concrete roof below. "It probably kept us from having to pick the panels up in the schoolyard next door," he says. Hart's proud of the work that's being done. "The things we're learning here, and the scale at which the VA is doing things, is ultimately going to make this affordable for people in their houses." He adds, "You make mistakes, and you learn from your mistakes. On the electrical aspects, we learned from it and moved on. We know what to look for next time, and the manufacturer knows what he needs to do." Now that the Dallas and Loma Linda pilot projects are completed, the VA plans to go forward, installing PV systems at 14 additional facilities. Loma Linda is already looking ahead too. "We haven't scheduled anything, but we would like to expand," says Barrett. "The system is currently only covering 60 percent of our effective-area we could easily expand 20 or 30 percent more." SunWize sees this as a real success. The installations demonstrate the viability of renewable energy in an urban environment and in facilities that operate 24 hours a day on life critical tasks. "It's a message to other like facilities that it can be done," says Bauer. How do the facilities feel about it? "Right now, we're still in the new car mode," says Hart. "We're still smelling the interior."